this portable workout guide. 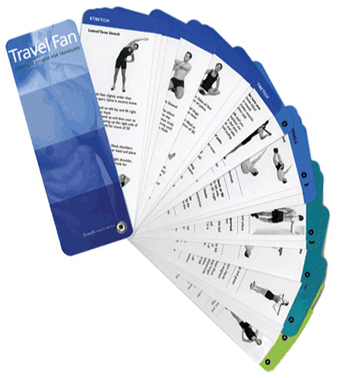 Strength training, cardio exercises and flexibility training in an easy-to-use, handy format. Over 20 exercises, 18 stretches, and 2 workout programs you can do anywhere. to the muscle groups you’ll work. Choose from exercises that use no equipment—only your own body weight is used for resistance — and exercises that use resistance bands and other portable fitness equipment. You’ll never have an excuse to miss a workout. This pocket sized workout includes complete step-by-step illustrated stretching and yoga instruction. Side one offers a morning series featuring an energizing Vinyasa flow sequence with 23 yoga postures (asanas). Side two has 7 stretches and an evening series of 14 yoga poses — perfect for anyone who wants to relax and restore mind and body. It also includes yoga tips for safety, form and alignment, as well as a glossary of terms. en and women golfers of all ages and skill levels can play a better golf game by engaging in a golf-specific exercise program. Golf fitness training includes cardio exercises, strength and flexibility training to improve your swing and increase stamina on the course. Choose from 26 strength exercises and 14 stretches for golf to add distance off the tee, and to increase power, control and range of motion. Improving overall fitness and training the primary muscle groups involved in swinging the club will enable any golfer to hit the ball with greater club head speed, increase distance with less effort, improve control for more consistent shots, increase coordination and prevent golf injuries. Inquire about customizing the Golf Fan for your next golf outing!